WATERLOO, WI--(Marketwire - January 16, 2008) - Trek Bicycle Corporation knows that its brand champions are technology-savvy, design-conscious and on-the-go. So starting on January 15, iPhone and iPod touch users will enjoy the total Trekbikes.com experience as the country's premier bicycle manufacturer becomes one of the first consumer product brands to optimize its site for the iPhone. "Trekbikes.com is accessed by a higher-than-average number of iPhone users," said Derek Deubel, Trek Bicycle director of marketing. "We wanted to provide those users with the same great features and gorgeous design of the Trek website without compromising content or usability." Trek Bicycle, Hanson Dodge Creative and Apple enjoy a history of cooperation and mutual respect as industry leaders in technology-forward and user-intuitive design. 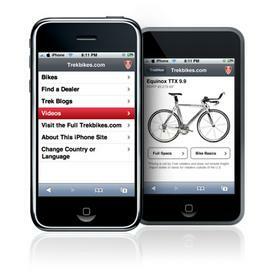 The three companies collaborated to provide the full-blown web experience of Trekbikes.com on the iPhone. Social sites like Facebook and some e-commerce sites like Amazon and eBay have begun designing specifically for the iPhone but, for the most part, mobile browsers have to reorganize content originally designed for a larger screen. The result is usually excessive scrolling and loss of design aesthetics. The optimized Trek site provides the most important features -- bike information, blogs, videos and a dealer locator that coordinates with Google Maps -- in a fast, responsive interface. Hanson Dodge Creative, America's leading brand experience designers focused on the Active Lifestyle Consumer, is Trek Bicycle's long-time agency. Hanson Dodge created the cycling company's full website and had all of the data available to make an iPhone-optimized version of the site. Since the iPhone runs the full Safari browser, Hanson Dodge easily retrofit the existing web content onto the iPhone platform. "We wanted navigation to be intuitive," said Dan Herwig, an interactive art director with Hanson Dodge Creative, "so we designed the site navigation to mimic the way the iPhone works. All of the menus look and behave just like the menus in the iPhone's operating system, so it is immediately familiar to the user." The result is a streamlined, efficient mobile browsing experience. Moving back and forth between the phone site and the full site is seamless and, most importantly, the brand stays intact. No matter where you are, it looks like Trek. You can check it out yourself on your iPhone or iPod touch at www.trekbikes.com. For images, contact Casey McCallum at 414.270.8394 or by email cmccallum@hansondodge.com. Headquartered in Waterloo, Wisconsin, Trek Bicycle Corporation is a global leader in bicycle design and manufacturing. From the original hand-built steel touring frames introduced in 1976 to the revolutionary OCLV carbon fiber first introduced in 1992, Trek's passion for innovation, quality, and performance leads the industry with next-generation technology and thinking. With an unprecedented eight Tour de France titles in the last nine years, six straight 24-hour World Solo Mountain Bike Championships, and countless other professional wins, Trek enjoys a rich tradition of victory in the world's premier cycling events. Today, with a broad range of bicycles and cycling products under the Trek, Gary Fisher, LeMond, Bontrager, and Klein brand names, Trek continues to pursue new ways to bring the joy of cycling to all people. Hanson Dodge Creative is America's leading design, branding and integrated communications firm focused on the active lifestyle consumer. Over 70 planners, marketers, designers and artists deliver insightful strategies, inspired design and maximum impact to an international portfolio of active lifestyle brands including Trek Bicycle Corporation, Burton Snowboards, Horizon Fitness, Johnson Outdoors, the Wisconsin Department of Tourism and the Saris Cycling Group. Hanson Dodge offers a wide range of strategic and creative services including brand planning, marketing communications consultation and innovative technology solutions. For more information on Hanson Dodge visit www.hansondodge.com.